Using a Rolodex or a spreadsheet to manage customer relationships often lacked the strategy needed to build long-term relationships. When CRM systems were introduced, they provided businesses with a long-term strategy to proactively engage and manage customer relationships, close more deals and automate recurring tasks. One common misinterpretation of a CRM system implementation is that it’s seen as a one-time event and that upon purchasing the software license, all broken sales processes, lost leads and lack of follow through will be repaired. While a CRM system is designed to support your sales process, it will not, by itself, cause your business to grow. This is why you should treat your CRM implementation as a long-term, company-wide strategy and not as a one time event. While C-levels and managers have the best intentions, CRM strategies often fail in the beginning of implementation. But why? 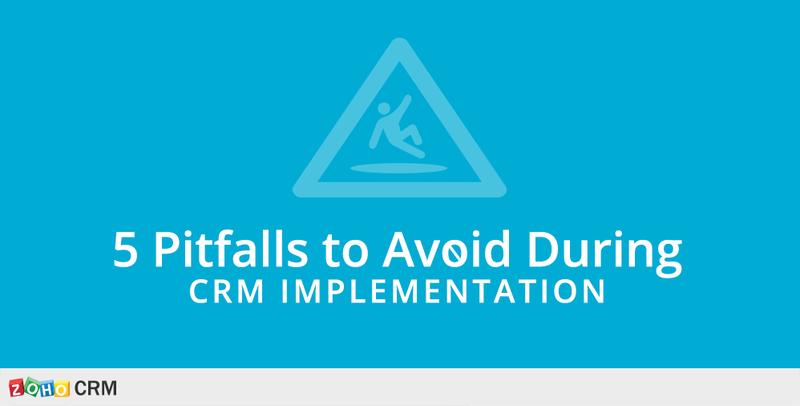 Here are 5 pitfalls you can avoid while developing your CRM strategy. Recognizing you have a problem is the first step. I know, you’ve heard that before. But this time, I’m referring to the problem in your sales cycle. Maybe you don’t even know you have a problem. CRM strategy starts before you choose the right CRM system. How do you manage all of the touch points your potential customer has with your business? How much time do you waste sifting through emails, call records and the scribbles in your notepad trying to remember when you last spoke to a customer? Who is in your sales pipeline and how much revenue can you expect next month? If you’re not sure how to answer those questions, there’s a good chance you have a problem in your sales cycle. After all, no one is perfect. It’s OK! 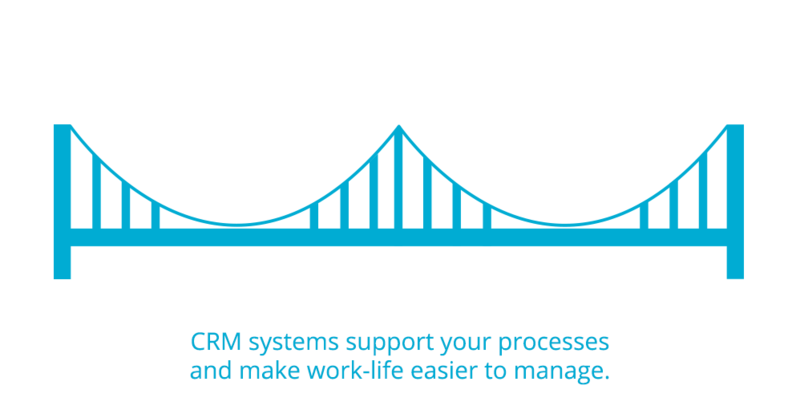 CRM systems are designed to support you and make your work life easier to manage. So, recognize the problem and own it. The good news is there’s a solution. 2. Failure to buy in to the value of CRMCommunication is key (when is it not?) in this situation. As a C-level exec ​or manager, make sure that you understand the value a CRM system has for your business. Once you understand this value, communicate the big picture and the value to everyone in your organization. I say “everyone” because each employee is a puzzle piece that fits into the bigger picture of your business growth. Providing context of how your CRM will support these roles (especially sales), will help your employees buy-in to your CRM strategy. How does a CRM system support our business growth strategy? 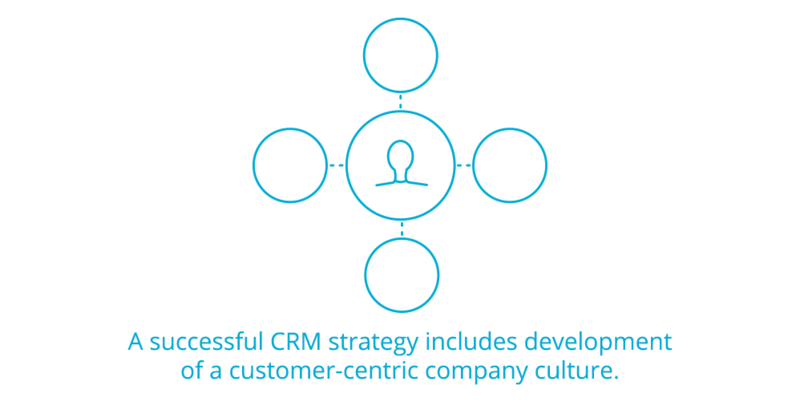 How will a CRM system provide value to a) each team and b) the entire organization? 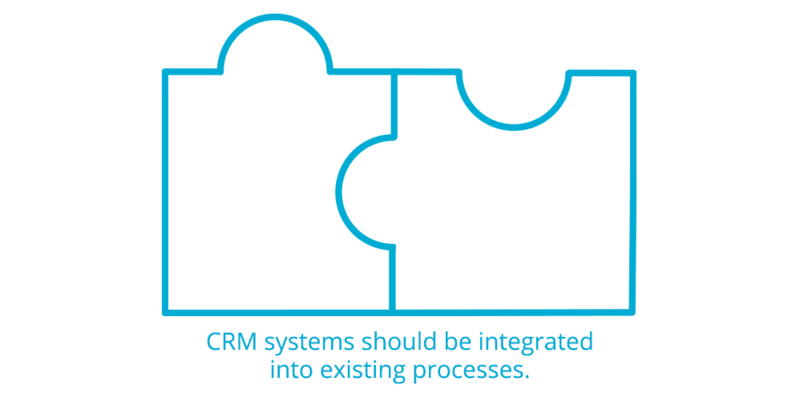 How will a CRM system provide context to each of your existing processes? Keep in mind that your sales team will need some extra attention during this transition. The last thing you want them to think is that you’re adding another mundane task to their already busy day. You’ll gain buy-in from your experienced sales professionals by providing context of how a CRM system is designed to take tedious tasks and errors out of their way, so they can focus on closing more deals. 3. Failure to Communicate Goals Before ImplementationTransitions open a door for misunderstandings, frustrations and loss of motivation. As a C-level exec or manager, set expectations from the beginning. Even if your goals are a bit unclear at the moment, give your team an idea of where you want to go and how the CRM system is going to be a process to get you there. 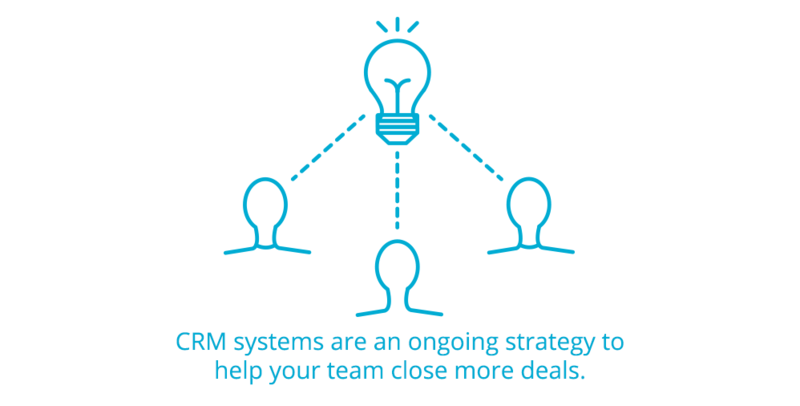 Again, a CRM system is an ongoing strategy to help your team close more deals, so your business can grow. Why are you implementing a CRM system? How does the upper management team expect CRM to support individual roles? What processes are already in place and how can a CRM system provide context to these processes? 4. Failure to Have Ongoing Executive SupportDon’t be the executive that has one meeting with your staff and then disappears. Be present and involved in the integration process. You’re not giving your employees a new process, you’re integrating a system into their already existing processes. Your employees trust you (if they don’t, then make sure you read this post on how to build trust in your team.) Be proactive in keeping your team accountable for integrating their processes with your CRM system. Maybe you’ve deployed your CRM system and can check off all the important items. You’ve created roles and profiles, migrated the correct data, setup workflow automation, put webforms on your website, setup lead assignment rules and scheduled your sales pipeline reports. What? You even integrated your Google AdWords account? Wow! You’re on top of it! Now comes the challenge of getting your team to use it. Uh oh. You didn’t think about that part. You thought your job was done, didn’t you? Setting up your CRM and deploying it, is just step one of your strategy. 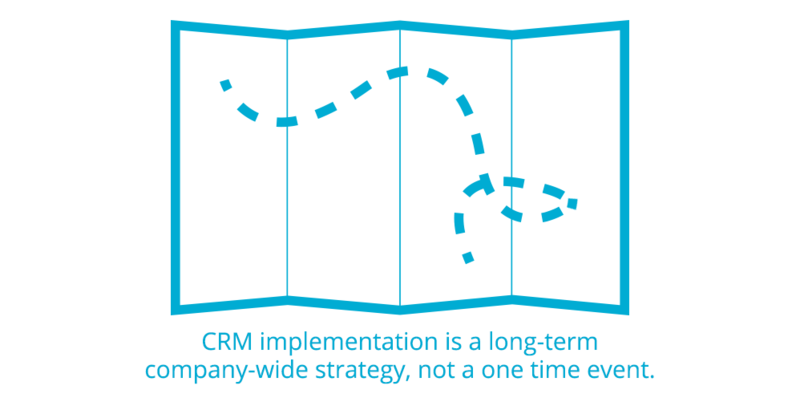 Your CRM implementation needs to continue after deployment. Remember, it’s a long-term strategy. How are your teams going to use the CRM on a day-to-day basis? How will your CRM system support your current sales, marketing and customer support processes? How will your sales team be held accountable for updating data on a regular basis? How will new employees be trained on your CRM system? What ongoing CRM training will you make available to your team?